According to EMI, Cliff and most reputable sources, Cliff's 100th single release is the song The Best Of Me, released in May of 1989. But it's not really so simple. 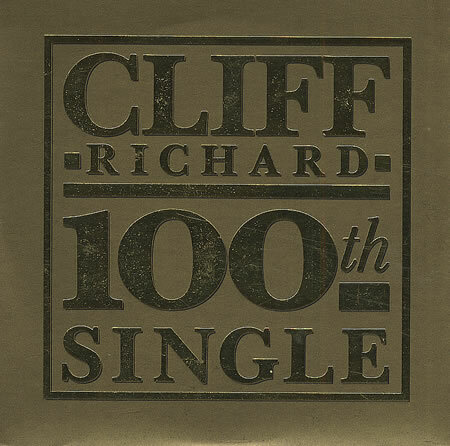 This page examines the concept of Cliff's 100th single and it may or may not be The Best Of Me, depending upon how you interpret the evidence. First off, we must define what a single is as some releases defy the standard definitions. Should the double A-sides such as The Next Time/Bachelor Boy or Baby You're Dynamite/Ocean Deep be counted twice? Or should they be counted only once because it was only one physical single that happened to have two hits? Then there is the four song single to consider from the 1973 to consider, which featured both Help It Along and Tomorrow Rising together on the A-side. At the time, this was called a "maxi-single", although that definition would be used again years later to describe a 12" single as well. Most discographies and the most reasonable assumption that lends credence to The Best Of Me as the 100th single only considers the physical single so The Next Time/Bachelor Boy and Help It Along/Tomorrow Rising singles are only counted once each. In addition, both Mean Streak and Never Mind charted separately, although the single they were on was never considered a double A-side. This single is also only counted once. Steve Turner's biography enumerates 126 singles up to Somethin' Is Goin' On, with The Best Of Me listed at number 100, which seems like a reasonable first proposal. But comparing this list to the A-sides on the tracklisting on The Singles Collection, Steve's is missing What'd I Say and adds the two singles with Hank, Throw Down A Line and The Joy Of Living. 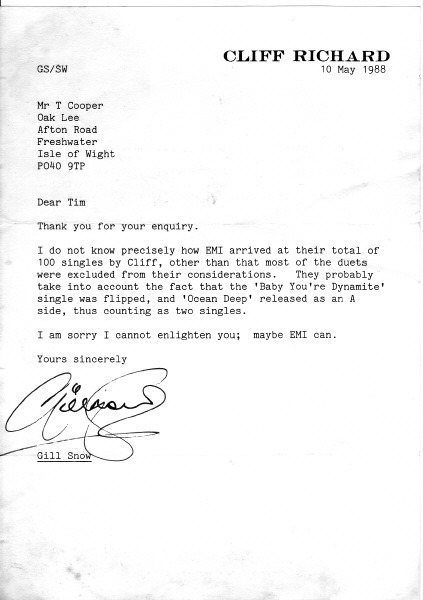 So the implication from The Singles Collection is that Cliff's 100th single was I Just Don't Have The Heart, and The Best Of Me was #99. If we surmise that Steve doesn't count What'd I Say because it was an export single, then we have to wonder why it does include Gee Whizz It's You and Angel both of which were also export singles. Gee Whizz It's You is different from the other two export singles in that when people began to import quantities of it and it suddenly showed up in the charts, EMI began to promote it as a regular single and it was played on the radio. What'd I Say and Angel got no known UK promotion or airplay. Curiously, if this is the criteria, then neither What'd I Say nor Angel should be included. Even more curious is that The Singles Collection includes all three foreign singles. Both The Singles Collection and Steve's list exclude This Was My Special Day. Although only sold at the Palladium, for all intents and purposes this was a normal release in 1964 with a normal catalogue number (DB 7435). Interestingly, if it is a normal release then this is the one that takes the honours for Cliff's first chart miss, rather than A Brand New Song nearly a decade later. But by most authorities, the way it was promoted, sold and its exclusivity excludes it. It was also billed as the show's cast with Cliff Richard, so that may be a reason to exclude it as well. There is also the issue of the non-solo singles: Throw Down A Line and The Joy Of Living with Hank, Suddenly with Olivia Newton-John, She Means Nothing To Me with Phil Everly, Drifting with Sheila Walsh, Two To The Power with Janet Jackson, Living Doll with the Young Ones and Hank, All I Ask Of You with Sarah Brightman, Slow Rivers with Elton John and Whenever God Shines His Light with Van Morrison. Some of these were quite big hits, and it is interesting to ponder the implications of not counting Living Doll with The Young Ones and Hank as one of Cliff's first 100 singles while still including it in his 14 UK number ones. Also, Throw Down A Line and Joy Of Living were not initially regarded as duets. It wasn't until The Singles Collection that EMI started to treat them as such and excluded them. Reports at the time regarded Goodbye Sam, Hello Samantha as Cliff's 50th single release and Cliff has gone on record stating as such. In order to achieve that count, Gee Whizz It's You is included, the other two export singles and This Was My Special Day are excluded, and the two singles with Hank are included. To get to the count of The Best Of Me as the 100th single, the non-solo singles must be excluded, but then why should the singles be included that are credited to Cliff Richard and The Shadows, or the Norrie Paramor Orchestra or the Bernard Ebbinghouse Orchrestra, etc.? These latter singles are surely included because they are Cliff on lead vocals, not duets proper, but that also brings up the question of why EMI is treating the Throw Down A Line and The Joy Of Living differently. Another method, probably more accurate, to get to The Best Of Me as the 100th single is to simply exclude all the singles that were not produced by EMI. This would also seem to generally jibe with the exclusion of the duet singles. Counting Goodbye Sam, Hello Samantha as the 50th single, then going forward and excluding all non-EMI produced singles, this would then exclude Suddenly (on Jet), Drifting (on DJM), Two To The Power (on A&M), Living Doll with The Young Ones (on WEA), All I Ask Of You (on Polydor) and Slow Rivers (on Rocket). This includes the Phil Everly duet of She Means Nothing To Me as that single was on EMI. This does, indeed, place The Best Of Me as the 100th single. Below is a table that attempts to show the ranking for different ways to count the singles. The first column, "All singles", lists everything, regardless of whether it is a duet, export single, etc. All other columns intentionally exclude This Was My Special Day because all known single counts exclude this song and it likely should not be counted at all. By most authorities, the most accurate count excludes all the duets except for the two Hank Marvin duets, excludes the three foreign singles except for Gee Whizz It's You, and excludes the This Was My Special Day single. This scenario is shown in the next to last column and curiously indicates that I Just Don't Have The Heart is actually Cliff's 100th single with The Best Of Me at #99. The only known way to get to The Best Of Me as the 100th single is to add an additional single to the count. But which one? Steve Turner's book mentions Angel in the discography, but not What'd I Say. The next to last columns shows the ranking with a guess of Angel as the additional single, but that remains simply a guess in order to achieve The Best Of Me as the 100th single. And finally, the last column simply excludes the This Was My Special Day single, the foreign singles Angel and What'd I Say, and all the non-EMI singles. This also achieves the goal of making The Best Of Me the 100th single. There likely is no definitive answer to how The Best Of Me can be considered the 100th single. I'll leave it to the reader to decide how to interpret the evidence.